I was invited to be among the first to purchase a pre-production model of the Elevated Movement‘s hammock. I was intrigued by the premise: a 100% recycled hammock (made from water bottles) with your choice of custom or pre-printed artwork, and 100% recycled webbing straps. Plus, it’s made in the USA (not just sewn or produced: all materials are sourced in the United States!). And wait, there’s more! The company is socially-conscious with support for planting trees, but my favorite part is the support for local artists. The owner, Matthew, has worked with a variety of artists who get 30% of the profit from their designs. If you’re quick, there is still time to join the Kickstarter campaign and help fund a great project. The hammock itself is extremely light for its size. The finished dimensions put it just shy of 10×5 ft, a common “double” hammock. At only 10 oz (285 g), and packing to the size of a large grapefruit, this hammock fits great in my lightweight pack yet doesn’t sacrifice on comfort. Speaking of comfort, I need to point out that polyester-based hammocks tend to stretch less than nylon (e.g., “parachute nylon”) versions. 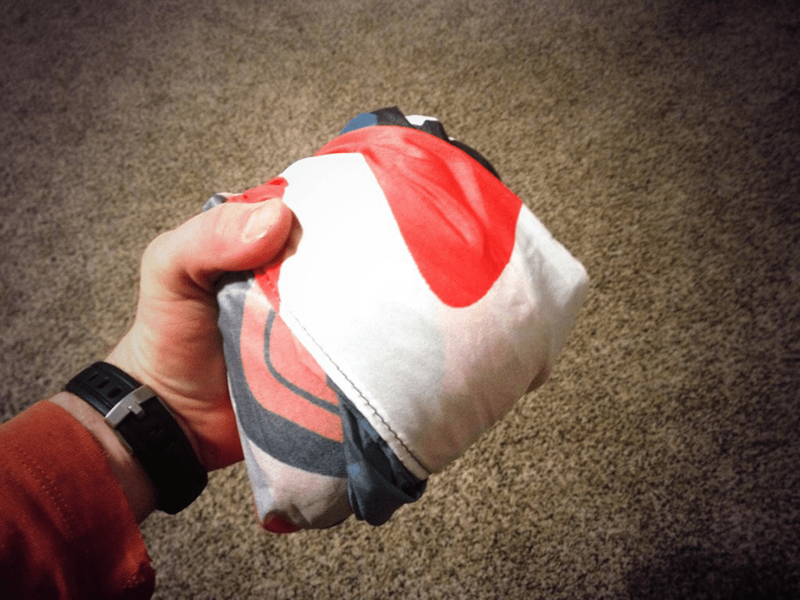 As with all hammock sizes, shapes, and materials, some folks will find polyester too “firm” for their liking, while others will enjoy the flatter lay. I prefer polyester hammocks on the whole because they provide more support for my lower back and have less shoulder squeeze (especially in comparison to 1.1 and 1.6 oz nylon fabrics). The Elevated Movement hammock is slightly more firm than other polyester hammocks I’ve tested, but I enjoyed it. I laid flatter in the hammock since the middle didn’t dip down where my heavier torso was laying. My hammock came with the webbing straps tied through the channels in the hammock. Matt supplied my hammock with metal tri-glides. These are simple adjustment systems and work well with the long length of webbing strap that came with my order. While there is nothing wrong with this suspension system, it isn’t my preferred method. Removing the webbing was easily accomplished and I then added continuous loops to the end so I can play with the variety of suspension systems at my disposal. Image courtesy The Elevated Movement. The artwork came out better than anticipated. The inks were solid and the colors vibrant. The artwork only appears on one side, although you can see a “faded” version on the reverse side of the fabric. 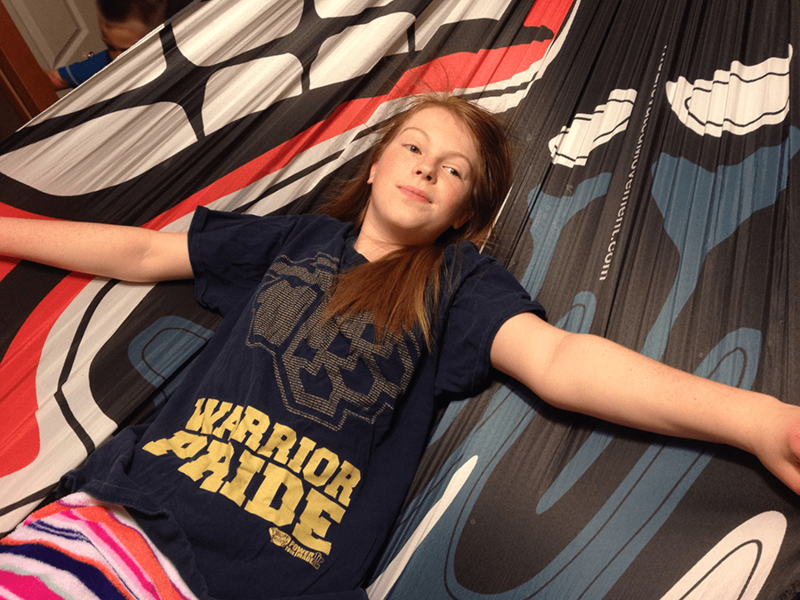 For me, the biggest appeal for the Elevated Movement hammock is the custom artwork. The nice lay of the hammock was a great surprise, which added to the value in my estimation (the straps aren’t bad either). I ordered a custom design of my own creation because I wanted something to hang in my hammock lab. If the hammock weren’t so comfortable, I wouldn’t be stuck in the dilemma I am now, which is whether to actually use the hammock or to hang it on my wall as I originally intended. Since the hammock turned out so well, it is likely that I’ll order a second custom design to sleep in and use this original version to frame. Previous: Previous post: Hammock Zipper Location: How Do You Spin? Sure Jason. I actually did a post and a video on hanging indoors that might interest you. Most of the time I use large eye bolts (at last count, I have 7 hang points in my house, in 4 different rooms). I have a pair of ENO’s hang kit in my master bedroom (it’s more discreet). I’ve read that hardware on hardware (carabiners on eye bolts) is bad. Certainly in some situations, like doing a multi-pitch climb up El Capitan, you want to minimize risks. Indoors with a hammock, I don’t have any problem clipping a carabiner to other hardware (you’ll note from the video that I use S-hooks and short chain links for adjustability). The problem with hardware-on-hardware is they can be very unforgiving if things flex. With a fixed-point hammock indoors, especially with a carabiner on a large eye-bolt, the twisting action that would cause problems is minimal if not nonexistent. Thanks again, Derek! Yeah, I remember watching your hammock video a long time ago, when it first started indoor hammocking. =:) Have you ever tried attaching climbing carabiners like the Black Diamond Neutrino directly to hardware like the ENO indoor hanging kit? Yes. I’ve clipped directly. As I said before, the movement and stress are far less in a hammock. Of course, I will not be liable if your equipment fails 🙂 adding a short cord or webbing is certainly a good idea and I do that in my room with the ENO hooks. Which, by the way, are just normal climbing anchors with the ENO branded on. LOL, yes, disclaimers understood. And I didn’t realize the ENO hooks were normal climbing anchors! I could probably get those cheaper! I guess I should ask Black Diamond directly to make sure their Neutrino biners are safe to use with stainless steel climbing anchors. I asked ENO that question and they said I shouldn’t mix different metal materials, and since their climbing anchors are stainless steel, I should only use steel biners and not whatever metal the Neutrino biners are made from. 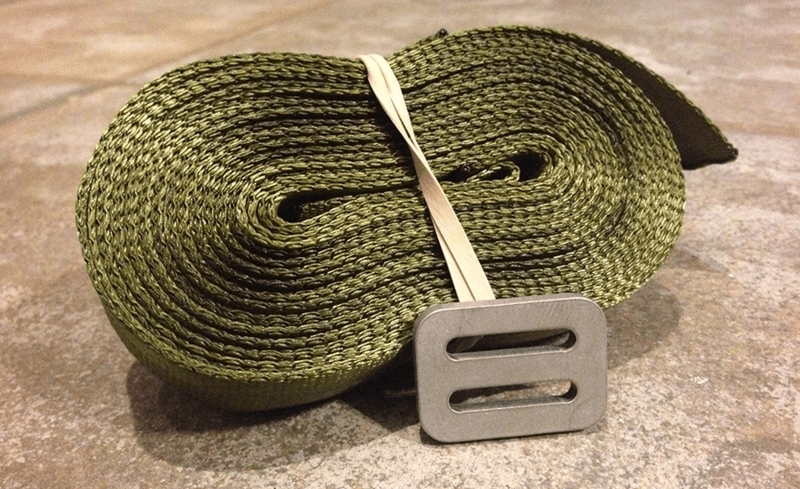 Also, don’t know if you knew, but ENO is shipping steel biners with their latest indoor hammock kits rather than the black rope they used to ship with. My nylon hammock is very breathable. How would this polyester fabric compare – might my skin feel clammy against the fabric? A lot of hammocks are poly based. Coated fabrics are the ones to worry about as they are not breathable. The polyester hammocks are very breathable. I’ve used many over the years and are usually my favorite fabric. 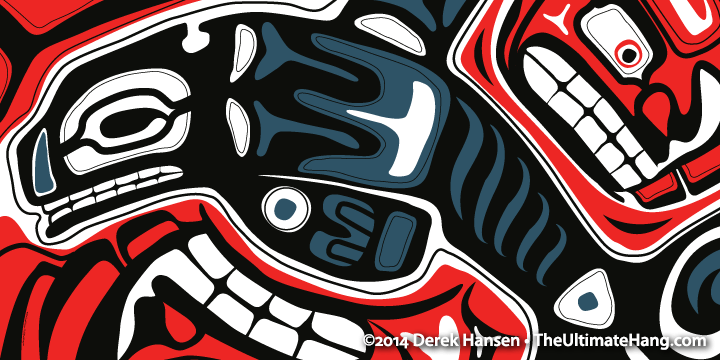 I really like the native Northwest style artwork. Is it possible to order poly fabric with this design (I enjoy puting the hammock together from scratch).? That’s my design 🙂 I’m glad you like it! I think it is available in the order field. Be sure to ask if not.